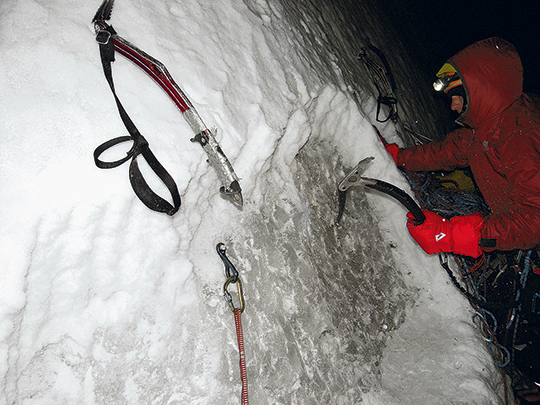 This story is from Alpinist Issue 30—Spring 2010. From time to time, we republish stories from our past issues to share with our readers. Alpinist is an archival-quality, quarterly publication dedicated to world alpinism and adventure climbing. Our small editorial staff works hard to create in-depth stories that are thoughtfully edited, thoroughly fact-checked and beautifully designed. Please consider supporting our efforts by subscribing. Alpinist Issue 30 is available for purchase. For more than nine years, a British prison guard fantasized about escaping his brutal surroundings for high peaks and undimmed night skies. After he finally quits his job, Nick Bullock begins a long odyssey that finally leads him up the labyrinthine North Face of Chang Himal—and into the shadowlands between dreams and reality, thought and act. STARS FLICKER IN A SLOW-SPINNING SKY. Old snow crackles. The moraine—a rubble-strewn lunar surface—creaks under our feet. A yellow moon lights our path. Ice gleams. Houseman and I are creeping like thieves. We're scared the mountain might hear our approach. 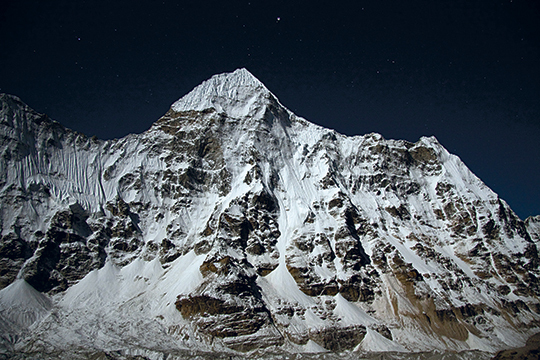 One thousand eight hundred meters of snow, cold rotten granite, thin ice skin, fluted sugar spines and a pointy summit that's so far above us—the north face of Chang Himal seems to pierce the Milky Way. Each day in our countdown to the climb, a cold wind blasted. Ghostly reefs of snow tumbled down Kangchenjunga. Spirits tore from the summit crest of Chang Himal. Now, twisting and turning into the dark entrance gully, I think of Eric Escoffier, blown without a trace from Broad Peak in 1998. That same evening, from our cornice bivy on Savoia Kangri, Paul Schwitzer and I could see a plume of snow lift off the top of K2 and vanish into the fading sky, and we tried not to think about the darkness beneath us. The wind is an unknown, unseen quantity: How do you prepare for the invisible? "Write a will, mate," Stevie Haston told me before I left my home in Llanberis, North Wales. Houseman and I reach the snow cone at the base of what we'd christened the "Narrows." Relief floods: the snow pack is hard. I look behind. Houseman is retching. "That's not in the plan," I say. He vomits again. "Do you want to go down, try again in a few days?" "No," he says. His voice is strained. "I feel really weak, but if you don't mind leading, I'll keep going. I don't feel sick enough to justify going down." His gaunt face and dark, intense eyes remind me of Pete Boardman, lost on the Northeast Ridge of Everest in 1982. Ten years later, Boardman's body was found near the top of a black tower. Houseman is only twenty-eight, and so young for his age, I call him "Youth." He's one of the few climbers with whom I'd want to be here. Stars dim. Snow ripples like sea-scoured sand. Flotsam emerges above the white sea: a black boulder, a corniced crest, the detritus of mountainfall. I dreamed about these fragments when they were just small forms of dark and light through my binoculars. Close up, they feel familiar. Now they are real. Youth follows, haggard. He leans on his axe. The boyish smile is missing. Would I still be climbing if I were this ill? We've left behind the seracs that may or may not pour down our line. The face tilts up. Under a shallow crust, rock sparks our crampons. The plan had been to abseil the line on V-threads. I push the descent to the back of my mind. "I'm feeling weak," Houseman says again. I stop and turn. Gray light unveils snow-covered mountains, hard ribs and hollow shadows in sharp radiating patterns like a giant coral skeleton against an oceanic sky. There's the jumbled moraine; there's our single, convoluted track cutting toward the base-camp tents, toward the small stone huts of Pangpema, Nepal. Welcome to my life, mate. Houseman is the same age as I was when I first started to climb. It doesn't seem that long ago, but it's been fifteen years. Time on a mountain is unearthly time, slow time. Still, it does not stop. Ever since my twenties I've imagined so many out-of-reach scenarios. Each daydream chilled me. I knew that one day I'd act them all out, whatever the cost. FROM UNDER A SMALL DOOR, a glow melted into wet pavement—wan light that neither warmed nor welcomed. That morning, as always, I pulled the latch shut on my tiny red brick cottage in Burton Overy, a small Leicestershire village, to drive down dark lanes as the rain danced. The red-berry hawthorn trees were leafless. A few brown wisps clung to twigs of skeletal oak. I barely noticed them. I'd lost myself in fantasies about quitting the Prison Service to climb full-time: high peaks in the Himalaya amid spindrift plumes and clouds and the sound of bells; warm rock and bright water in Spain; the blue ripple of an icefall in the Alps; the crumbling blaze of Gogarth stone. A path had been instilled in me since my youth: "You work hard; you take the job that pays the best whether it gives satisfaction or not; you meet a girl; get married; have kids; support your family; buy a house." And as my granddad said, "Neither a borrower, nor a lender be." At twenty-one, I'd walked through that prison door into a life that was supposed to be regimented until my retirement. By the time I was twenty-eight, my mind jumped in and out of dreams of escape. Climbing seemed like anarchy. No one resigns. No one gives up security. Just a few more minutes to dream.... Routine is safe. But safe is minutes, hours, days, weeks, months, years. Safe is a quick existence. All too soon, Welford Road Prison loomed in the yellow sulfur center of Leicester City, the solid sandstone fortification, the castellated towers, the large wooden double entranceway—and the small door, with the pallid glow. One last deep breath of exhaust air, and I stepped through the ghostly light into the shadow of cast-iron girders, steel stairways and exposed pipes, polished handrails worn smooth by weary hands. "Three's landing unlock for slop out, medication, bang up the one's, unlock the cleaners...." The shout came from the senior prison officer, in the center of the two Victorian wings. Echoes reverberated like the calls of climbers scaling canyons. Here, three levels of railing, thick metal doors and wire netting stretched like trampolines to catch falling bodies. I'd entered a space turned inside out. Everyday values were a sign of vulnerability, and the rules of survival kept changing. The smell of waste rose, pungent as the sea. Flotsam and detritus. Unwanted lives. I inserted the key into the lock of a cell door. Against a dark corner, a shadow waited. Just another dreamer rattled in my head. Security is a sentence. YOUTH STRUGGLES TOWARD ME. Dawn glows from under the horizon. The shadow fades to clear air and white slopes. I close my eyes while I wait. The key turns, and the cell door opens to another, unexpected view: last summer in North Wales. Six years had passed since I'd finally saved enough to leave the Prison Service at age thirty-seven. Tim Neil and I were attempting Helmet Boiler, a Mick Fowler route in Mousetrap Zawn, Craig Gogarth, on the island of Anglesey. 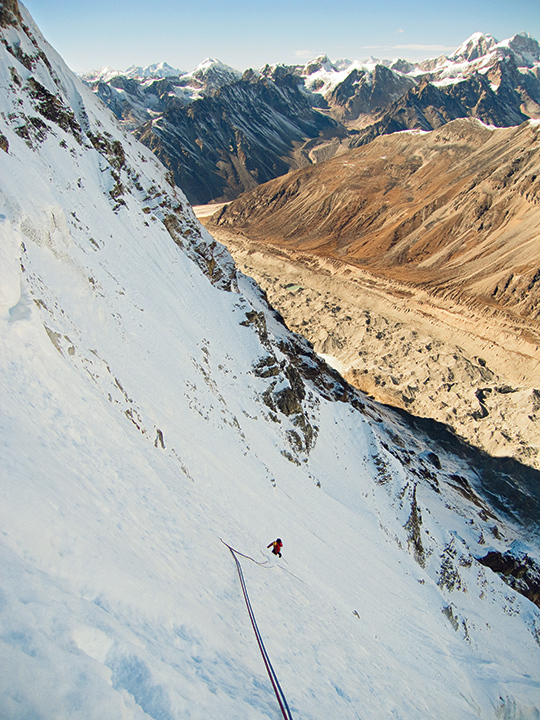 Helmet Boiler was a route most climbers wouldn't consider—a kick against a certain outcome. Only a handful of people knew its runout horror, and the grade wouldn't impress anyone. The ropes ran in a long, traversing arc below me, held only by a quartz protrusion with a sling around it and a rotting twenty-five-year-old peg. Soon my mind was dragging me into depths of red, yellow and gray quartzite, down walls sprayed with white guano and rippled with gray mud. I stood on an island of relatively good rock in a sea of softness, digging and scratching, scraping mud from more mud, searching for something solid. I excavated a crack, and it crumbled. In the midst of the overhanging mud, a quartz hold jutted like a glass doorknob. I'd have to use it to escape this wall. Quartz has a tendency to snap. I climbed toward it, then reversed back to my island several times. At last I wrapped a hand around the knob. Seagulls shrieked on the wind, flight feathers ripping. Waves washed in fishing floats, tangled orange nets, yellow bubbled scum. Yet higher up, a smooth quartz band did. The clock hands spun, and I was falling—mud and madness and pain, that crusty old peg won't catch me—and just as quick I slapped for the knob and caught it. Once more, it held. I screamed at Tim, and he screamed back. The sea swept into the zawn, and the seagulls cried life. The clock hands slowed.... Minutes became hours again. By the time I slithered from the mud runnel's exit, I overflowed with energy and light. The key would never turn for most of the prisoners. In that moment, I was free. THIS IS WHAT I DID: I imagined my way into these insecure places, fighting spindrift toward summits or pulling on loose summer rock, stuffed tightly into overhanging runnels of ice or mud. A week before we began to climb Chang Himal, I stared up and pictured my small figure on its north face, where the shadows curled from spines of summit snow. "I can't imagine setting off to climb something so big and unknown," my friend Tom Briggs said. We were sitting in chairs, side by side at base camp. He was a bold British trad climber, who'd joined us for the trek in. I was intimidated by the routes he climbed. "It scares me just looking and imagining being up there," Tom said, "in the middle of that. What makes you want to put yourself in that position?" My eyes watered with the intensity of the sun. Brown grass withered around us. Wallowing yaks cut crescent trenches into the earth. High above, seracs tilted and tottered, just enough to warn and tempt. Black rock, overhanging rock, serrated ridges, scalloped snowfields wavered across a vast white sheet. Shade and light arced over it, with the sweeping of the day. Ravens circled. The wind dug the trenches deeper. I wanted Tom to stop talking. How do you prepare yourself for the invisible? Now Houseman and I reach the first in a series of questions, the smaller of the two rockbands. "Do you mind leading this?" Houseman says. I can hear his honest Northern childhood almost choking him: Neither a borrower, nor a lender be. In the pub, Youth liked to tell stories of breaking trail for me or catching my falls. If I led for a whole day, he might be quiet in the future. Soon I'm adding up rotten snow, thin ice, limited protection, exposure and a big pack. No rescue.... No rescue.... Nine days of walking lie behind us: green-tangled forests and flowing water; rough-turned patches of dark earth and flooded rice fields; spiderwebs that stretched across bamboo stalks thick with insect cadavers; icefalls that slithered above a village of weathered wood; and those yak bells that made our base camp feel somehow like home. No rescue. Write a will, mate. Home is a lifetime away. A block—flattopped—gives a momentary reprieve. I stand on my frozen island and try to swing the blood back into my wooden hands. Control yourself. Warm your fingers. Place some protection. Warm your fingers. Swing your arms. I swap feet, hook a glass-thin piece of ice, a lump of rotten snow. An hour later, we're digging into the center of the face. I'd imagined our first bivy in dreams while I lay warmly wrapped in base camp, listening to the yak bells; in dreams during the hike in to the mountain; in dreams before we even reached Nepal. I'd seen us settling in for the night on a snow step. Our words were hushed, our minds excited. The wind and the warmth of partnership wove a closeness around us that didn't seem possible in the valley. The step gave a feeling of belonging more than any brick house could. Here, snow sloughs, and the wind blows only cold. Mick Fowler grades his bivies for comfort. "Five" was a lie-down. "One" was hell. I zip up my two jackets and pull the sleeping bag around my shoulders. Base camp is a glowing dot. Three. The summit cuts the gray clouds in pieces. They stream about the face, covering the stars, hiding base camp. "I don't like the look of the weather," Houseman says. "It'll be desperate if it craps out." His face is pale. I think of the inmates I fought, pressing their heads against the cold floor until the blood drained from their cheeks. "Stop being negative," I say. With one thousand meters already behind us, I don't want to contemplate bailing. "Or at least keep the obvious to yourself." I've retreated too many times. I only imagine up on Chang Himal. Alpinist is an archival-quality, quarterly publication dedicated to world alpinism and adventure climbing. Alpinist Issue 30 is available for purchase.